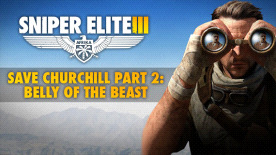 Save Churchill Part 2: Belly of the Beast is the intense second mission of a new three-part campaign for Sniper Elite 3. In the outlying mountains of North Morocco a concealed facility is being used by Axis forces to create devastating new weapons of war and build an elite unit of the Führer’s most devoted soldiers. Among them is Raubvogel, the elusive German sniper behind a plot to kill British Prime Minister, Winston Churchill. You must find out what you can about the planned assassination and stop these new weapons from leaving the remote facility. Save Churchill Part 2 can be played alone or in online co-op.